Construction and demolition waste (CDW) is one of the largest solid waste streams in Europe, accounting for around one third of the controlled waste within EU 28. As a consequence of economic development, there is concern about CDW as a cause of environmental pollution. From the viewpoint of urban mining, this stream is a potential source of secondary raw building materials which can be used to replace primary sand, gravel, clay and limestone. A special point of concern is the very low commercial value per ton of primary raw materials used in the building industry. 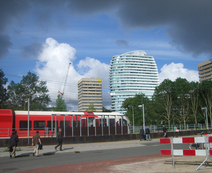 In the Netherlands most of CDW is currently used as base for roads construction. However in the near future other applications are needed because of the unbalance between demand and offer of such material. The same development is known from the north west of UK where concrete is currently commercially recycled to concrete at large scale. At European Union level most of the CDW is still being land-filled. The single most important reason for this to happen is the cost of the available processes which place the secondary raw materials obtained from CDW out of the market. Hence C2CA may contribute to creating a sound material-cycle in which there is a simultaneous pursuit of environmental preservation and economic development in the form of new business opportunities and improved competitiveness of European SMEs and industries. The demonstration of the economic and ecological viability of this technology have been tested on a case study in which the recycling of old buildings and the building of new one was integrated into a single project. It was demonstrated that an appropriately designed, equipped and performed selective demolition in the Netherlands costs only 15% more than the traditional demolition practice, the cost being nearly compensated by the value of the quality materials recovered from the post-demolition waste via the C2CA smart processing of the recycled concrete. Because of the positive results obtained, two start-up companies (named Grondstoffen Recycling Hoorn” - RAW Materials Recycling Hoorn and ADR Technologies) have been set up to exploit the project results on the market. Besides the innovative C2CA recycling technologies for the recovery of the EoL concrete fraction, different business models to implement them have been devised. These models should minimize the trade costs along the value chain thanks to no transfer of ownership of waste along the process (thus no fees) and to the long-term trust-based cooperation links. Possible governmental policies that facilitate an efficient transition towards a combination of optimal value recovery from C&DW and sustainable building should promote green public procurement, by means of minimum recycled material use targets that can be requested in public tenders. The project Advanced Technologies for the Production of Cement and Clean Aggregates from Construction and Demolition Waste, in short C2CA, builds on strong European academic-industrial partnerships in the fields of waste processing and recycling, including those involved in areas such as cement chemistry and sensor technologies for quality control. Instead of using EOL concrete in road construction, it will be effectively separated into its constituent components such as gravel, sand and cement paste by which it becomes suitable for high-value applications such as clean aggregates and new cement. Sensor systems have been investigated for the purposes of both online quality control and documentation of properties of the raw secondary materials in the complete recycling chain from demolition to mortar production. The strategic goal of the project is to create a Europe-wide, sustainable, high-value outlet for EOL concrete. At present, the recycling infrastructure for EOL buildings has advanced to the point that buildings are being effectively dismantled and selectively demolished to produce a number of highly concentrated waste fractions. Altogether, this new green technology offers distinct environmental benefits. Besides the environmental benefits, the following can benefit from this new technology.